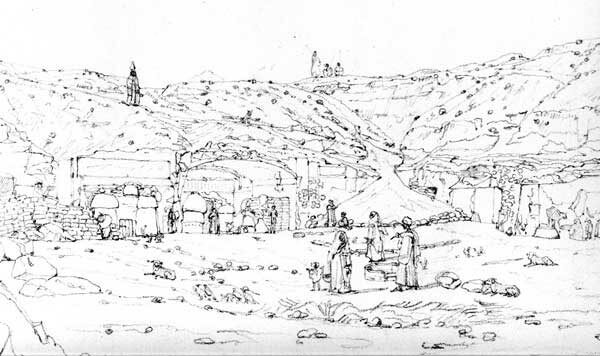 This drawing shows an extended family living in a multi-tombed area in the Asasif (the area between Hatshepsut's Temple and the fields). The pyramidal peak of the Qurn can just be seen in the background. The family is busy outdoors early in the morning before it gets too hot. A wide variety of 'mud things' can be seen outside the interior tomb-dwellings. Detail from one of the 360 degree panoramas of Qurna. This shows a group of men digging for mummies or antiquities at the base of the hill in the Nobles Tombs area. This is very close to where the empty Omda House now stands, just west of the Horubat Mosque. One of the men looking on is probably as overseer, paid by an employer with a licence or 'firman' to excavate and export antiquities. Click here to read a discussion on Qurnawi and antiquities. 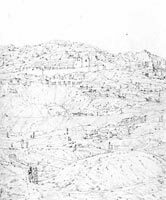 This drawing of Seti 1 temple shows the annual inundation covering the eastern area of the temple complex. The low walls on the left are the walls to the palm groves mentioned by E W Lane in his Description of Egypt. It was in this area that the medieval and 18th century village of Qurna stood. Click here to read more about the history of Qurna village. The Panoramas show all the houses in the Nobles Tombs area. High on the hillside is the tomb-house of Sir Gardner Wilkinson with its towers and mud-brick out-houses. 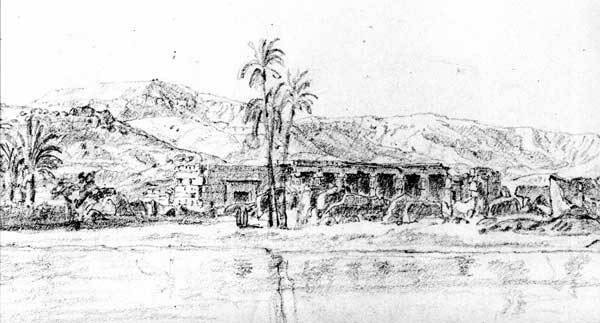 Wilkinson was one of an important group of artist-scholars who lived and worked in Qurna for many years. The house was the home of generations of Egyptologists long after Wilkinson had returned to England. Wilkinson's extensive publications included his "Manners and Customs of the Ancient Egyptians", "Handbook for Travellers in Egypt" , "Modern Egypt and Thebes", and the maps of the "Survey of Thebes". This detail, from a three page panorama drawn from a point at the east end of the Muslim cemetery, shows these three domed shrines of local saints. Two of these still stand, and one is thought to be of Fatimid date - 10th-12th century AD. It is the earliest Islamic building still standing in the Qurna area. The drawings also show people on the main north-south road on the west bank, which skirts the eastern edge of the cemetery.